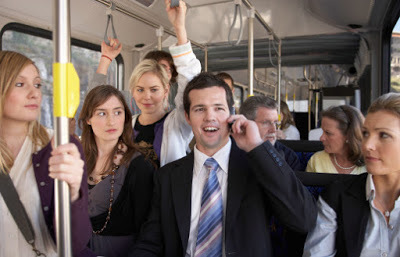 I’ve written in the past about cell phone etiquette, and my belief that the evolution of social norms (and fear of the stink eye from others) have helped stem the tide of loud, intrusive, one-sided conversations in restaurants, elevators and other public places where less information about your neighbor is definitely more. Yet even now, not everyone has gotten the memo. Early last week, I commuted home from work on a packed San Francisco MUNI bus. I had a seat because I boarded at the first stop, but when a bus is delayed by more than 30 minutes on a weeknight, even the lucky seated few feel penned in like veal. The guy standing next to me — my face and his bait n’ tackle separated by only a few inches of air and a thin layer of khaki — was chatting VERY LOUDLY on his cell phone. Let’s just say this fellow had a face made for radio… but not a voice. And he had positively no social filter. He started off explaining that he was still quite ill after a full course of antibiotics – EXACTLY what other passengers on a crowded bus want to hear, am I right? If things didn’t improve by the end of the week, he planned to go back for something stronger. He never disclosed exactly what was wrong with him, but I had enough details to be thoroughly creeped out. Yes, well my friends told me that if I ever want to get back into the online dating scene, I should take down that post since my Facebook privacy settings are public. I really didn’t agree, but I followed their advice anyway. I am not sure which was less shocking – that this guy is single, or that he posts sensitive, personal information on Facebook for anyone to read. Privacy settings? Privacy is for wimps, that much was clear. Well, I had to have surgery so they could CUT it out. It was very big. Like a very large…. wart, essentially. I say “cut”, but they really had to GRIND it out. And then — just like that — he was gone. I never even found out how many stitches he got, or what kind of ointment he was using. And while I know plenty about his physical infirmities, I don’t even know his name. As he exited the bus, I couldn’t help but notice how other riders cleared an unusually wide path for him. Like me, they no doubt washed their hands with the vigor and precision of an ER surgeon as soon as they got home. Ah, the joys of public transportation. In the words of Kermit the Frog… It’s not easy being green.